Your Small Business's Web and Mobile Presence & Its Importance. 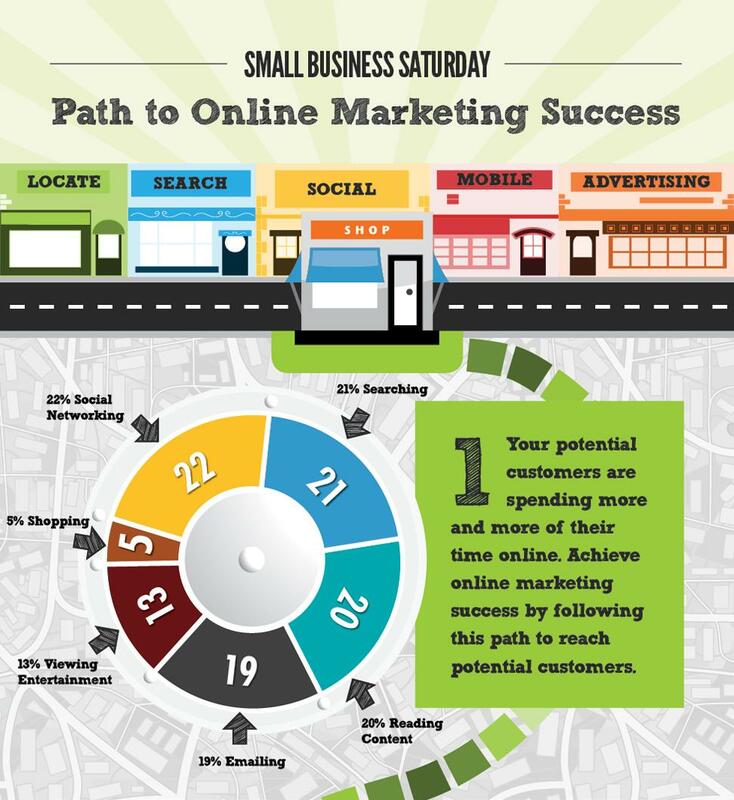 I recently read an article on Mashable regarding the web and mobile presence of small businesses today and it featured this infographic, which was originally created and circulated by ReachLocal. Everyone loves a good infographic, right? They’re bright, colorful, and if you’re lucky, they actually do a pretty good job at getting a message across. This was one of those infographics. The key statistics covered by the graphic do a great job at communicating many of the major factors that play into the importance of a strong web and mobile presence for small businesses today. In fact, I liked this infographic so much I decided to write about some of the main figures it contains. Part 1 of the infographic features a pie graph detailing the primary activities in which the average internet user engages. If you take a look at some of these figures, some of the activities that really pop out include 5% of the average internet user’s time on the web being spent on shopping, 22% on social networking, 21% on search queries, and 20% on reading content. Combined, these items add up to a whopping 68% of an internet user’s time that is spent in areas where he or she could be linked directly to a small business’s website. This figure jumps to 87% when you consider the prospect of email marketing, specifically by use of e-newsletters. Part 2 further emphasizes the importance of the 68% (or 87%) figure. It states that 85% of consumers searching for local businesses do so online. More importantly, it notes that 63% of said small, local businesses do not maintain a website, plus an additional 25% that do have a web presence, yet fail to appear in searches. These two figures combine for a massive 88% figure of businesses with a non-existent or inefficient web presence. It doesn’t take any serious math to calculate the scale of missed opportunities across the board for small businesses. It is almost staggering how substantial these figures are considering that by 2012, one would expect most entities, even small businesses, to have long since gotten with the it’s-2012-and-I-need-a-website program. Part 3 focuses on social media. Realistically, 87% of all small business owners seeing value in Facebook is actually pretty good. Today, Facebook should be ubiquitous, the number should be 100%, but when you consider the variation in age and computer savvy of small business owners in America, it’s pretty impressive that 87% even know about Facebook, let alone see its value. What would be more telling of a number is one that factors the actual usage of Facebook by small businesses. Twitter at 60% is way behind where it should be. Twitter has become a staple in online marketing and online web presence that can no longer be ignored. A company Twitter account’s existence and number of followers tell a lot about a business’s legitimacy, and is often used by prospective customers and business partners as an indicator of such. While Twitter is not quite as well-established and widely used as Facebook, its numbers are growing to the point where Twitter is a must have for any small business. It’s free and relatively easy to maintain, no excuses here. Part 4 is where things get interesting, and this plays heavily into the fastest growing trend of the infographic; mobile presence. The big figure here is the 66% of smartphone users who utilize the mobile web to make purchasing decisions. I do this all the time, especially when looking for electronics. Whether you’re looking for a review, a product description, or just to verify that you’re looking at the right product, consumers are literally begging for your product to have a mobile presence. So why shouldn’t it? I’ve written about this before, and I’ll write about this again – the internet is moving to your smartphone. Obviously don’t forget about your standard web presence, but don’t get left behind either. When your prospective consumer is making a purchase, he or she will search on his or her phone, and if your product isn’t listed, I promise that this person will no longer be your prospective consumer, because he or she has already moved on to your competitor. This happens at home, on the way to the store, at the store, and everywhere in between. I cannot stress this enough: get a mobile presence! Bare in mind that these are statistics from 2011. In just the 1-2 years since this infographic was created, these figures have only grown, and this is the type of trend that will only continue to grow. Capitalize on it now and take the charge in your industry instead of chasing your competition. Finally, part 5 discusses the 2012 projected growth of search, display, mobile, and social media. Take a look specifically at the figure for mobile growth. That 128% number speaks for itself, and this estimate was actually understated. If your small business makes up one of these statistics, it’s time to make changes – and fast. The business world is constantly evolving. What might have worked ten years ago is obsolete and changes are occurring at an increasingly rapid pace. What you can count on however; is that 2012 is coming to a close, and in 2013, you don’t want to be the small business without a website or a mobile app.